Also wrote four novels as Hilary Landon. 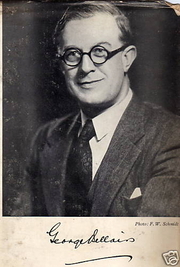 Bellairs was a pen name for Harold Blundell, who was a banker when not writing.On retiring he moved to Colby on the Isle of Man with his wife. His personal papers are in the John Rylands Library (Univ. of Manchester). George Bellairs is currently considered a "single author." If one or more works are by a distinct, homonymous authors, go ahead and split the author. George Bellairs is composed of 6 names. You can examine and separate out names.